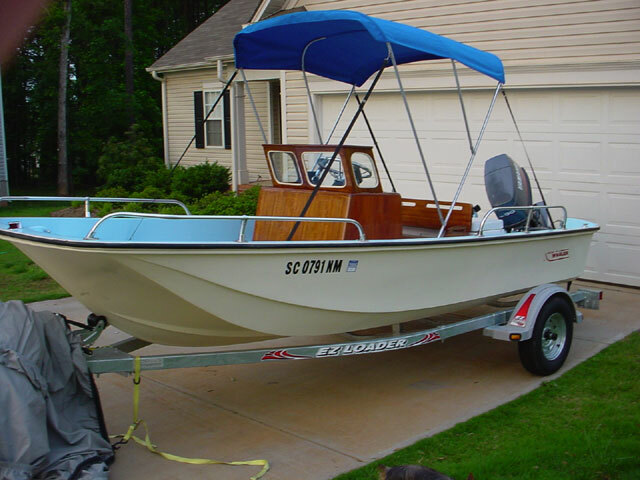 Ever thought about restoring a 33-year-old Boston Whaler? T.T. of South Carolina finished this project about a year ago. The boat looks great, the pictures are excellent, and the narrative that accompanies them is very nicely written. "My story is probably typical among younger Whaler owners. 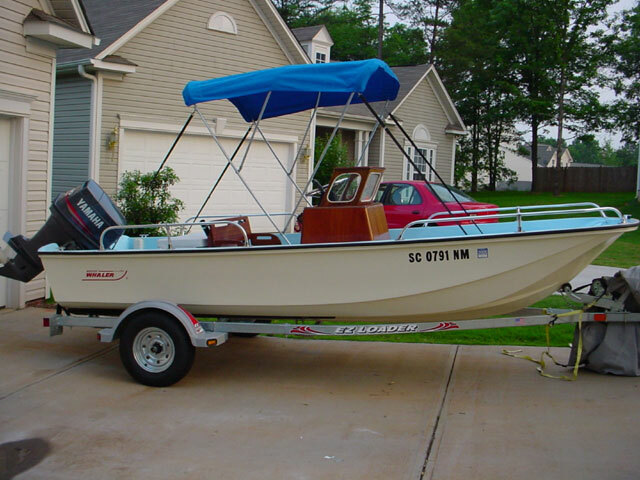 My Grandfather bought a new 1970 13-foot Whaler with a 25-horse Evinrude. He taught me how to fish and swim during my time aboard that boat. Since then I have wanted a Boston Whaler of my own. I could never replace those memories of my childhood with paw paw and that old Whaler. I guess I just wanted to try to re-live them even though I'm a grown man and he's in his late 70's. I am proud to say that he and I have fished out of my whaler a few times together and have caught a respectable catch each trip. The refinished boat got his stamp of approval. 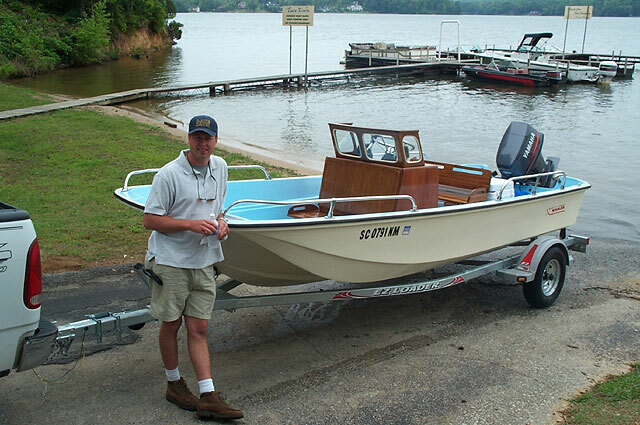 The work that went into restoring this old classic whaler was done to honor those fishing trips of my past and my grandpa Rob. "This old 1970 17-footer was found in Charleston, SC and purchased by a good friend. It had been in storage for a while and was in fair shape. The interior was brown epoxy and the hull was original gel coat that had cracked and blistered. The engine was a 1972 100-horse Evinrude with electric push button transmission. I bought the boat from him three years ago for five grand and used it very little because I was afraid that old engine would die and leave me afloat. I recently decided to buy a new engine and ended up with a 2000 Yamaha 90-horse 2 stroker. That's when things got a little out of hand. "I began looking at my old beaten boat and thinking what a shame it would be to replace the engine and all the running works and not replace some of the rotten wood. So I took out all of the wood and had a friend who does cabinet work replace every piece that came in contact with the hull. 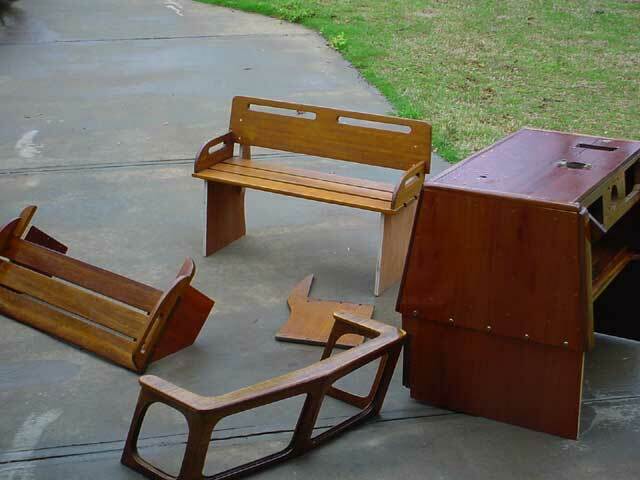 Then I decided to refinish all of the wood so it would match. That task, my friend, is an undertaking! Anyway, without the wood I saw just how bad the old paint looked and decided it would be best just to repaint it as all the wood was sitting on my garage floor in a thousand pieces. 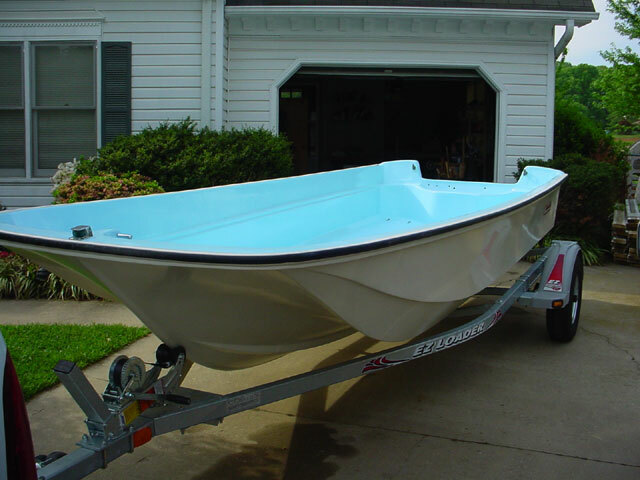 "The hull was refinished by a local fiberglass re finisher and painted back original blue and off white. I just thought to myself what a shame to keep that old vinyl top with a hole in it, so I had the top redone in Whaler blue fabric. "The financial hemorrhaging didn't stop till I had a new tach, water fuel separator, new lights which had to be rerouted through the rub rail, a new EZ loader and a fancy $30 trailer hitch lock. When I finally came to my senses I was $8,500 lighter and the owner of a damn fine looking 17-foot whaler. I am 33-years old and my friends think I'm living in the past, but they hold their heads high when they climb aboard (or they remain at the dock). The old 100-horse Evinrude would run about 35 MPH. The new Yamaha runs 48 MPH with the top down and that's no fish story. "The boat is a looker and a runner but shes not exactly made for the ladies. The ride is smooth and steady and in heavy chop it will wet you from head to toe. The only soft place to sit is the cushion on the cooler, and a man can get a powerful sunburn even with that blue top flying. That said, I think this whaler is just perfect for my use. I plan on putting a large amount of fish in this boat to match the duckies I have invested. But there are times I must admit when the money seems well spent. An example of such a time might be at 6:30 am and the sun's coming up over the misty low country marsh lands. I've got 6-dozen live shrimp, a dozen cool pilsners, one sausage biscuit, and a couple good friends to help hoist the top. Now on this type of day an oyster bed surrounded by marsh grass is a great place to start one's exploits. 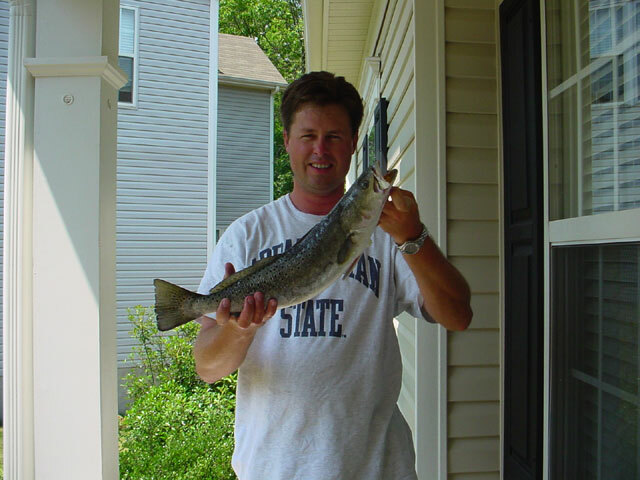 We bait the hooks and float live shrimp along the intracoastal weeds of Charleston for Reds and Trout, and perhaps enjoy a cool barley pop with my good friends John and Jeb while we laugh about how I got on roll when I decided to replace that old Evinrude. Now that my friend is a bargain. All the wooden components of the interior were removed for refinishing. With the interior removed, the hull was professionally restored to its original colors. 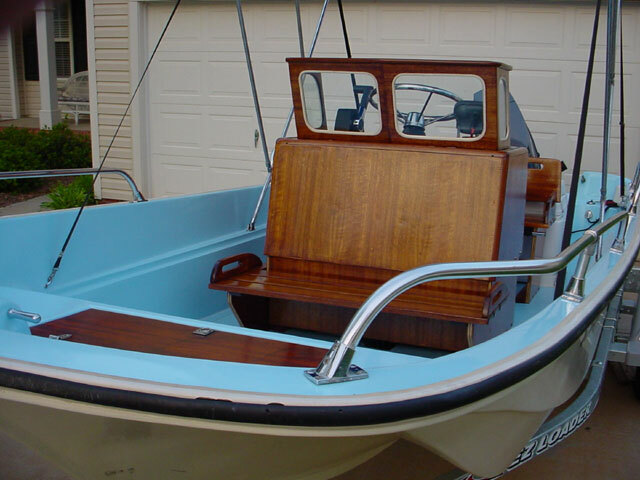 The next step is to put the refinished interior back into the refinished boat. Next Step: have the sun top restored with new fabric. And get a new trailer, too. 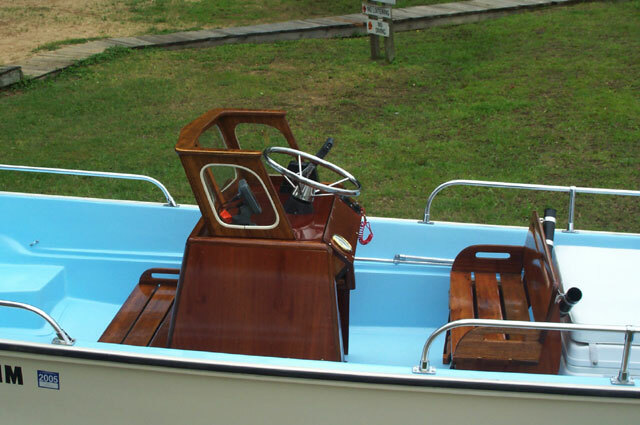 This boat has bow rails, an option, but these don't match the ones shown in the 1970 catalogue, which are much higher. With a 90-HP 2-stroke on the transom the ol' Nauset is ready for launch. The 1970 Nauset not only looks good, it catches fish, too. The page has been accessed 36774 times.